I’m the news director of a small TV station in upstate New York, and a few weeks back we decided to put more effort into our station’s web site. “More effort,” in this case, meant two or three updates during the working week, and still pictures to go with the stories. The stories were no problem, since CBS provides us with a web-based system for writing copy. The same system allows us to place graphic elements with our stories and – this being television – pictures are considered a good thing. Best of all, we have a ready supply of pictures. All we had to do was capture still images off the videotape we shoot for television and massage the stills a little bit for the Web. Unfortunately, the two systems best suited to the job are Mac-based non-linear editors on the other side of the building. Even though we’re well-networked, we couldn’t just ask our commercial producers to continually drop what they’re doing during the busiest part of the day to make stills. Then, since each graphic needed to be re-sized, the images had to be run through a copy of Photoshop that resides on a machine in the program director’s office. This method for getting stills worked when we were doing one story a day and a few graphics a week, but I knew it wouldn’t take much to strain it past the breaking point. The answer came in the form of an old 1993 Quadra 660av I bought many months ago and set aside after playing with it for awhile. The machine was about as bare bones as it gets: 24 MB of RAM, only a 40 MB (!) hard drive, and no CD-ROM. However, it is (as some of you know better than me) capable of digitizing video straight out of the box. Here’s what we did: The 660 went on the floor in my office with a minimum install of System 7.5 – the System Folder weighs in at 11 MB. Then I put a copy of Apple’s Video Player version 1.4.1 (circa 1996), Quicktime 2.1 (circa 1995) and a program called Video Monitor (circa 1993) on the hard drive, raising the grand total to just over 13 MB. I grabbed a spare VCR, plugged it into the back of the 660, and began grabbing stills. (Video Player displays the tape as it plays – and either Video Player or Video Monitor lets me grab “freeze frames” of the image.) I think the whole project took about half an hour. I drop the captured image onto a floppy, bring it over to the Power Mac 7200 on my desk, and convert it into a JPEG for posting to the Web. Here’s what I learned: We shoot on a high grade format called Beta SX (Sony’s digital Beta format), but I record airchecks of our news on dirt cheap, use ’em a hundred times, plain old ordinary VHS cassettes – and the image I get off the VHS tapes is good enough for most web pictures. So now I either grab a still off a newscast aircheck, or I ask one of my reporters to quickly dub a few seconds of their footage from Beta to VHS. True, the wiring of this little project made the rat’s nest in my office a little worse, but it’s dirt cheap, and it works just fine. Considering that the equipment and software involved is 4-6 years old, Mac loyalists have much to be proud of. 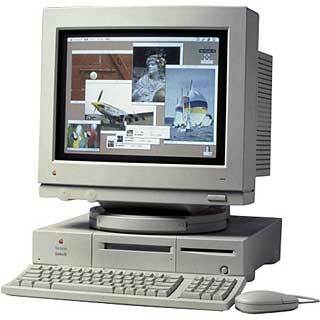 I also think it shows the continuing value of the attitude behind Low End Mac – that being old doesn’t make a Mac any less graceful, and that these marvelous machines still have much to teach us. Scott Atkinson was News Director at WWNY TV in Watertown, NY when this was published. For more on the AV Quadras, see 660av/840av Video Input Specifics and Quadra AV FAQ, both by James Wang.